Whistlers Cove was a result of many requests from owners of my sold-out print "The Turning Tide" for a new Newfoundland study. So I spent time with four beautiful dogs in wonderful surroundings on a lovely sunny day. The scene itself is imaginary but it was based on Reighton Sands near Filey. I photographed rock pools, seaweed, shells, dead crabs (suitably posed) and the white rocks above the high-water mark. During my day with the dogs I noticed one often laying with his head on his paws and I felt compelled to create a companion print featuring the pose. 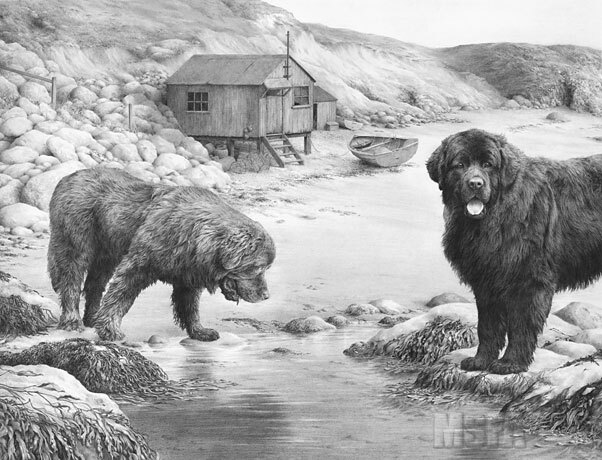 The black dog was not nearly so accommodating but at the close of the day, as the heat diminished, he graciously agreed to hold a pose which led to the second companion print and the main study. The original drawing took 154 hours 55 minutes to complete and is still available for purchase. image : 16½" × 13"